It’s been a while since we’ve shared what’s going on with HAYP as we prep for our next exhibit, so here’s another Behind The Scenes feature. The great news is we finally have our space! (Pfew!) We also have an exciting new artist line-up (the artist call is open until March 30th). Expect a more international group this time around, with artists from Argentina, France, Italy, and the USA added to the mix of local Armenian artists. We’re also planning our events, which includes an aerial dance performance (yup, you heard me), live music, improv theater, and possibly a poetry slam/reading. We’ll be sharing the improv theater info shortly, a new collaboration HAYP started with Sonya Armaghanyan who will bring the 24HourTheater to Armenia for the first time! If you have an event you’d like to propose, contact rachel.nersesian@gmail.com. You may or may not have noticed this empty storefront on Abovyan street at the cross section with Northern Avenue (you can’t get more central than that!). 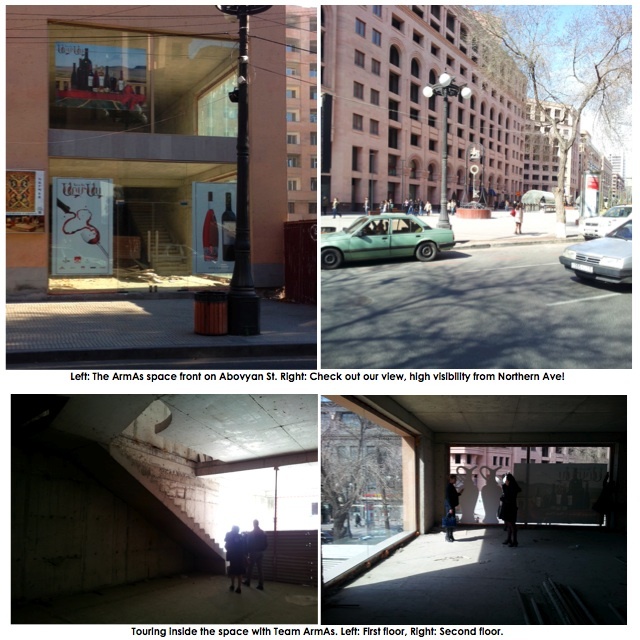 As you can tell from the window posters, this two-story space is owned by ArmAs wines. If their name sounds familiar, it might be because you love their wine and their vineyard (definitely worth a visit), or maybe you saw them at our opening event in December. They are just as psyched about HAYP as we are, which makes for a great partnership and an exciting opening night event. 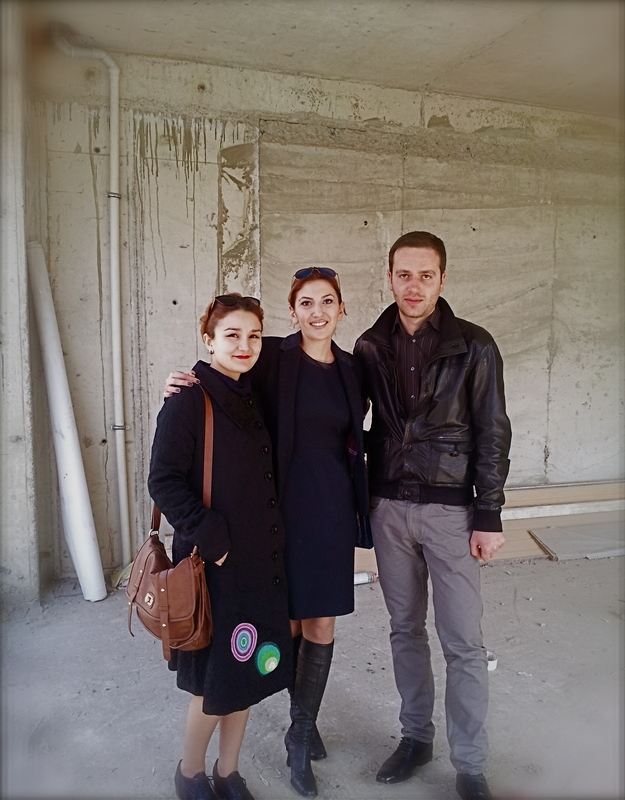 Team ArmAs, with CEO Victoria Aslanyan at the center, and Manushak and Hagop at her side. We’re going to try something very new for ANKAPital. Since the majority of the artworks are “Street” Artworks, murals and performance, we’ve decided to have “Satellite” projects around Yerevan. This means that we’ll be making a “HAYP map” of events and exhibits so that you can explore the city through art, like in Yerevan’s dalans (tunnels/archways), courtyards, cafe’s and/or squares. The city really IS our gallery. If you have an idea about a location or project, contact us here: info.hayp@gmail.com. Basically what he’s saying is that curating isn’t just about putting artworks together in a room, but about building meaning. Having said that, we’re carefully selecting our artists and artworks to make sure that each piece relates to the theme individually, while also creating a relevant and meaningful conversation through their relationship to one another. Above is a sneak peak of two of the artists in show. Ruben Malayan is a graphic artist, calligraphy artist and painter from Yerevan, Armenia who’s lived and worked in Tel Aviv and Toronto. He currently lives in Ashtarak, Armenia. RIZEK is from Barletta, in the Apulia region of Italy, and has worked as a DJ and electronic music artist in addition to his work as a Street Artist. You may have seen some of RIZEK’s work on our Facebook page, where I published a “Behind the Scenes” album of my trip to his studio. I Skyped recently with Noumeda Carbone, another Italian artist who’s work truly blows me away. She’s an illustrator, graphic artist, and Street artist born in Paris that currently lives and works in Florence, Italy. She’s worked as a fashion illustrator for big names like Ferragamo, Leo Burnette, and others to create meticulous and whimsical illustrations with slightly darker undertones. 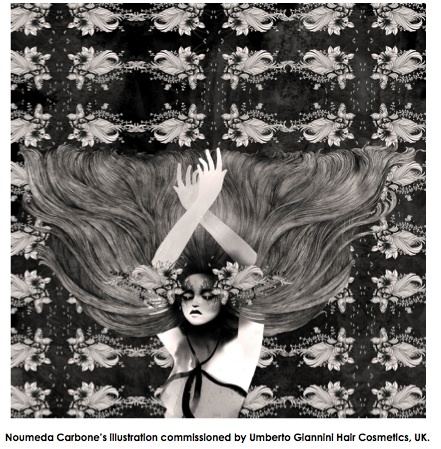 To the right is an example of her fashion illustration work for Umberto Giannini Hair Cosmetics, UK. Below is a a photograph of Noumeda in action creating street artwork in Florence. We’re working hard now to find some funding so that we can bring Noumeda to Yerevan and have her create a live performance-mural at HAYP Pop Up Gallery. That’s all I’ll share for now on our artist line-up, but keep checking out the HAYP for more updates on upcoming Art and Events for HAYP 2.0, ANKAPital. If you’ve read the Call to Artists, then you already know about our exhibition concept. I wanted to expand on this since I’ve had a variety of questions about the theme and the timing of the exhibition, considering that April is a sensitive month in light of the 100 years commemoration of the Armenian Genocide. The project is called “ANKAPital”, and the title is a play on words stemming from a much-loved Armenian term, “ankap”, or disconnected, and “capital” implying city or metropolis. The theme was born from a love-hate relationship of the city: both a place of growth and development, but also friction, disharmony, and sometimes injustice. When taking a closer look at Yerevan, we notice many disconnected realities: you can find beauty, amazing people and projects in the most unexpected places. It’s what, on one hand, is so incredible about this city: moments of authentic creativity, love and hope. While on the other end of the spectrum, there’s a lack of communication, infrastructure and organization that prevents and even stifles the development of the city and the country as a whole. So like I said, we’re taking a critical eye to these very real and present issues that so many of the youth are tired of and ready to change. We want to show not only contemporary art, but also an authentic contemporary voice. HAYP is optimistic, but being optimistic doesn’t mean to close your eyes to the problems around you, but rather to see those problems as opportunities for change, growth and transformation. Ironically, although the exhibition implies disconnect, we hope to connect by bringing together: international and local artists, technology and art, and diverse media like theater, music, dance, and the visual arts. Hopefully by creating a unifying platform for the exchange of ideas and art, we can have an honest discussion about what’s important to us as a community and what we can do to nurture those values. As per the timing of the exhibit, April will be a highly touristic month as Armenian diaspora and non-Armenians alike gather in solidarity for human rights and to honor this country, the memory of a past tragedy, and the prevention of future such tragedies. Many exhibitions and events in April will be commemorative themed, and HAYP simply wants to show an alternative theme. HAYP Pop Up Gallery wants to share with this diverse public the work of local and international artists and what we can create when we come together to celebrate and support our present talent in order to build a better future. 24 Hour Theatre: Call for Participation!